Actually, to be more specific, I’ve been writing a book–my deadline is now only a month and a half away. (Because all good things take TIME–including the logistics of hammering out book contracts–I haven’t been able to let the cat out of the bag until now.) But guys, I couldn’t be more thrilled–Time and Despondency: Regaining the Present in Faith and Life will be published by Ancient Faith, hopefully this fall. So let’s get this party started!!! So first of all, what is despondency? Well, it’s one of the many (inadequate) translations of a Greek term (acedia) that Christian theologians used to describe a spiritual sickness whose symptoms include things like restlessness, worry, distractibility, despair, and lethargy. In Greek, acedia literally means the absence of care or concern–the Fathers interpreted this with particular regard to the spiritual life. When we are despondent, we stop bothering to concern ourselves with important matters like prayer and God. It afflicts us spiritually, but trickles outward to poison our whole lives. I’ve always seen despondency to be a direct correlation of the broken relationship we tend to have toward time. It’s no that hard to care about something–anything–for a moment or two. What’s hard is to keep on caring, to keep on showing up in the arena of life, moment after moment, day after day, year after year. In our devolution into carelessness, we escape from the present moment to the past (via regret or a sense of failure) or to the future (via anxieties, fears, or incessant desires and expectations). Beginning to heal from despondency, as I see it, is a process that rests on returning to the present moment, which is the only time we can commune with God and encounter the resurrection. In doing the research for this book, I’ve become convinced that despondency is not just an affliction of monastics–as a number of early theologians thought–but a sickness of our times. I see it playing out constantly–in my life, in the lives of my loved ones, and in society at large. We live in a culture of escapism–now more than ever, given the tense political environment. I started working on this project before the 2016 election started being in the news, and it’s been interesting to watch things unfold through the lens of my interest in despondency. Things have gotten so fragmented and contentious. In the face of complex, troubling, and seemingly insurmountable brokenness, our first instinct as humans is to throw up our hands, trudge dejectedly out of the ring, and binge watch Netflix. The more we follow that pattern, the more despondency tightens its grip on our heart, and the more we become locked into a pattern of thought and action that turns from God, reality, and our fellow man, and towards the insularity of our empty selves. But Christ calls us to more. He calls us to stay in the arena–not the arena of saving the world, but the arena of prayer (which, depending on how you look at it, is how you save the world). The arena of dwelling with Him. The arena of being alive in this life He gave us, in all its shadows and highlights, crosses and resurrections. He calls us to leave our stupor of apathy and face the pain of caring. It’s not an easy pain to face–it’s not an easy pain to write about. But I’m showing up, the best way I know how. In the meantime, you can go and give the original Time and Despondency series a listen–it’s perfect for this awkward, right-before-Lent-starts season we’re in! I think this is great news! Thank you! I can’t wait to read your book! God bless your efforts! I certainly think this a timely project. Your Podcast series provided a different perspective that was insightful to my experience. It seems appropriate that today (January 30th) our daily reading includes the shining light parable from Matthew 5. May God bless. Thanks Tim! I hadn’t realized that–thanks for sharing. Glory to God! 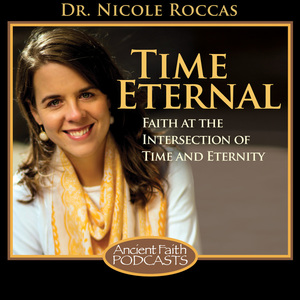 I think the podcast series started about Lent time last year – I remember listening to those “timely” episodes driving to work, and appreciating even the tangents! (I had listened to some of the Doxacon podcasts that had to do with time travel, etc. but none of those were so appropriate for me, personally, as the Time and Despondency podcasts were – thanks again! Looking forward to hear the interview with Bobby Maddox (introducing the book 😉 and reading it soon. Thanks! Yes, it started just before Lent last year. I won’t be doing a Lenten series this year unfortunately–it will be time for a break for me 🙂 But I’ll still be blogging and some sporadic podcasts as time permits. Take care and have a blessed feast day, J.!